Street dance (Hip Hop) is fun and energetic and has grown ever so popular today. It is made up of various styles such as breakdancing, popping, locking, krumping and so much more. 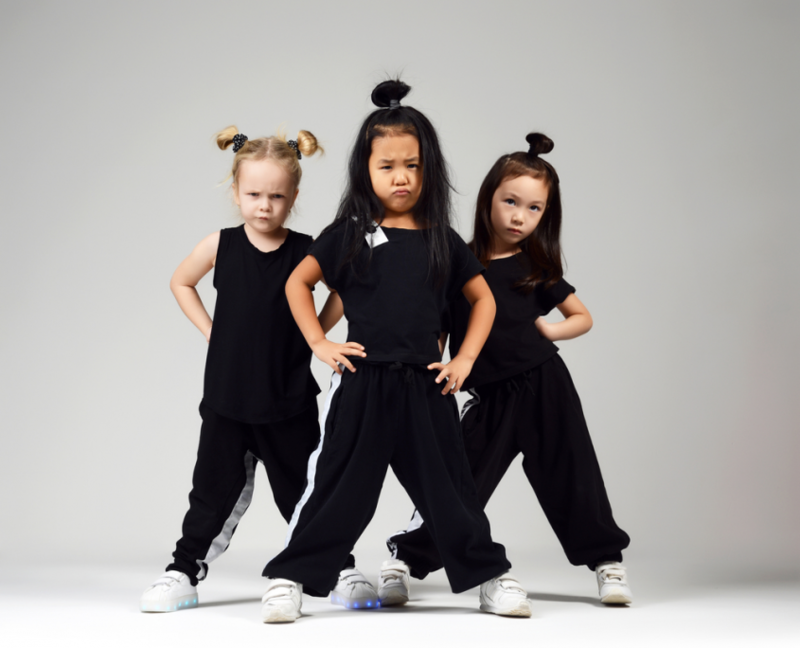 Our early years street dance group are known as Lil Rascals. The children in this group are introduced to street dance in a fun and easy manner. Chosen music for this age range is often current songs that they are likely to have heard on the radio or on the television. Familiarity often helps to increase focus and motivation in children, therefore progress is often quicker. Rhythm, timing and coordination are key dance skills to learn at this stage. Children in this class are taught how to count routines by either using numbers or sounds. Choreography is created based on suitability to the students and entertainment value. Children will always to be given routines that are within their reach with challenges to ensure they are being given the tools to improve. As well as being taught choreographed routines, basic breakdance techniques will also be taught at this early stage. Ages 7-10 are in a crew called ‘Lil Munchkins’. In the junior stages various music and artists are introduced, to enhance their music appreciation and interpretation. They will begin to explore choreography to different tempos and rhythms. At this stage coordination will continue to be worked on and more techniques such as popping and house will be introduced. Performance skills are greatly encouraged with Lil Munchkins as an essential skill for performing on stage. This includes facial expressions and body movement. Energy, precision and group awareness including more complexed transitions will also become stronger at this level. We have three youth street dance group’s known as Hydra, Ophion and Lethal Chemistry. Those in this group are often preparing for many street dance competitions as well as general performances. In this class the ability to interpret music is a key focus as students of this level are expected use the music and the beats to their full advantage. For dancers wishing to participate in stage events, performance ability is just as important as dance ability. Using various techniques (often drama) dancers are prepared by their tutors to use facial expressions and body language. This makes their stage presence incredibly strong. In rehearsals positions, transitions and group awareness is considered vital. Dancers should become aware of their group members to ensure they are in sync.